One of the best summer activities you can enjoy in Cody, Wyoming. River trips are an essential part of summer vacation – floating through canyons and past mountains, the hot sun shining down with the cool river flowing underneath and the excitement of running rapids. No summer is truly complete without at least one good river trip; luckily, you can find river trips of all sorts just outside Cody, Wyoming. How Much Experience Do I Need? Can My Kids Come? None! There are plenty of guide companies in and around Cody that can help you get down the river safely. Some guide companies even take people who don’t know how to swim. While not every trip is suitable for younger children, many trips are. Whether your child should come depends on where you’re rafting, your child’s comfort in whitewater situations and current river conditions. Talk with a guide company while planning your trip – most companies can accommodate families with all ages. During the high months of summer (June, July and August), expect temperatures to reach up into the 70s and 80s during the day and drop into the 40s or 50s at night. Late fall and early spring (October and April) can be considerably colder, with temperatures staying in the 50s and 60s during the day. Mid-June and July usually sees the highest water and biggest rapids. May and June usually get the most precipitation, while August and October tend to be the driest months. Most rafting trips from Cody, Wyoming take advantage of the Shoshone River, the major drainage below eastern Yellowstone. The Shoshone River runs from the Absaroka Mountains and feeds the Buffalo Bill Reservoir just west of Cody before splitting into the North and South Forks. Eventually, the Shoshone River feeds into the Big Horn River. The river was used as a common trading route by Native Americans and early white trappers. Just to the west of Cody, Colter’s Hell is an interesting historical point along the Shoshone River. This area of volcanic activity is characterized by hot springs and fumaroles – openings in the earth where steam and gas escape. Regardless of the rafting trip you choose, Colter’s Hell is worth a stop on the way by. 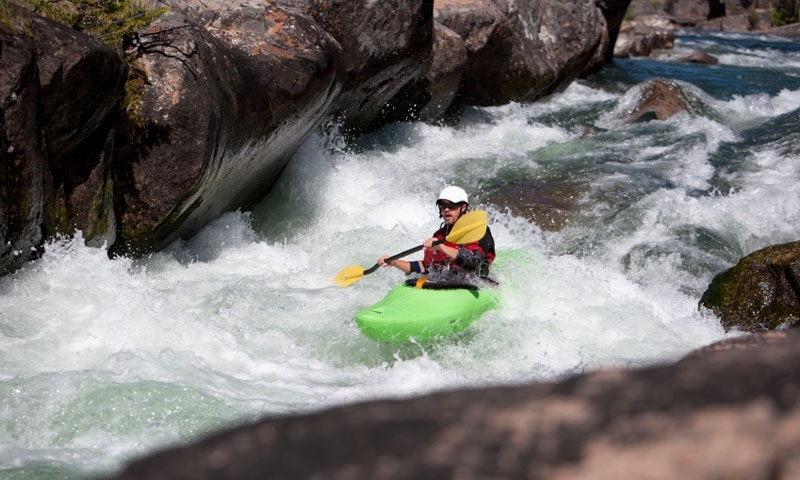 While the 100 miles of the Shoshone River has many options for rafting (and kayaking), here are a few of the more popular commercial and private trip options. This mostly Class II and III section of river winds through the Red Rock Canyon and is a great fun and scenic introductory raft trip for families with younger or older members who may not be comfortable in bigger water. The wildlife, beautiful scenery and red canyon walls will transport you to a whole other world. If your family is interested in a river experience that’s a little bit different, consider a trip down Red Rock Canyon in an inflatable kayak – safe and easy to maneuver, these fun boats let you explore the river your own way. With larger, more difficult rapids, the North Fork is one of the more exciting raft trips just outside Cody, as well as, in the words of President Teddy Roosevelt, “the most scenic 52 miles in America.” From the East Entrance of Yellowstone National Park, this stretch of water flows through Wapiti Valley and Shoshone National Forest and back toward Cody. Along the way you’ll find larger Class II and III rapids, good fishing, an abundance of wildlife (rafters often sight bighorn sheep, elk, moose and eagles) and scenery you’ll have a hard time forgetting. Below the Buffalo Bill Dam, the Shoshone River cuts its way through the Lower Canyon, a unique geological experience. Mostly Class II and III rapids, this trip is ideal for families. Stretches of the Lower Canyon are popular with kayakers, as well. If you’d rather be able to lay back, relax and watch the scenery flow by, the Cark’s Fork of the Yellowstone is an absolutely beautiful stretch of water that cuts through a canyon of picture-perfect Wyoming landscape; it’s no wonder the Clark’s Fork was the first designated Wild and Scenic river in Wyoming. Trips on this stretch of water will enjoy mountain views, a plethora of wildlife, excellent fishing and a trip through an area with a rich cultural history. Stretches of the Clark’s Fork also feature Class IV, V and VI rapids, and should only be attempted by serious, experienced river runners. Find local companies that offer Rafting Trips in Cody.